BECKET, Mass. 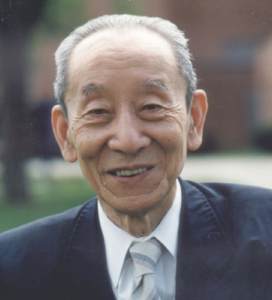 — Michio Kushi, macrobiotic educator, natural foods pioneer, and founder and chairman of Kushi Institute, passed away in Boston on Dec. 28. He was 88. Born in 1926 in Wakayama Prefecture, Kushi graduated from Tokyo University. His studies centered on political science and international relations, especially past and contemporary efforts to create a federation of governments to establish world peace. He came to the U.S. in 1949, settled in New York, furthered his studies at Columbia University, and met Albert Einstein, Thomas Mann, Upton Sinclair, Pitirim Sorokin, and other prominent scientists, authors, and statesmen. To expand his understanding of human behavior across time and history, Kushi also studied, and was deeply influenced by, Western civilization, Middle Eastern culture, and Indian philosophy and medicine. His father was a professor of Renaissance history in Japan, his mother taught at Christian schools, and young Michio had been brought up in a unique East-West social and cultural environment. Before coming to America, Kushi met George Ohsawa (Yukikazu Sakurazawa), a prolific Japanese author, health educator, and world traveler. Kushi’s interests and Ohsawa’s teachings complemented each other so well that their newly formed friendship and collaboration would last until Ohsawa’s death in 1966. In the late 1950s, they started to apply the word “macrobiotics,” a traditional term for the way of health and longevity, to their teachings. Together with his wife Aveline (1923-2001), Kushi built on and expanded Ohsawa’s teachings and the long lineage of dietary philosophers and health reformers around the world. For the past half-century, Kushi was vigorously engaged in teaching and learning activities throughout the U.S., Europe, Asia, the Middle East, Africa and Latin America. Since the mid-1960s, when the Kushis started Erewhon Trading Company, the groundbreaking natural foods store in Boston named after Samuel Butler’s utopian novel, the organic, natural foods revolution has spread around the world. Macrobiotics introduced and popularized organically grown whole foods and naturally processed foods, including brown rice, millet, whole wheat, and other whole cereal grains; azuki beans, chickpeas, and other beans; miso, tofu, shoyu, tempeh, and other traditionally processed soy foods; nori, kombu, wakame, hijiki, and other mineral-rich sea vegetables; daikon, kale, burdock, kuzu, and other fiber- and mineral-rich vegetables; white sea salt, toasted sesame and other unrefined vegetable oil, umeboshi and other seasonings and condiments; amasake, brown rice syrup, barley malt, and other natural sweeteners; bancha twig tea (kukicha); and other healthful foods and beverages. In 1978, Kushi founded the Kushi Institute in Brookline, Mass., in order to teach a new generation of students to meet the challenges of modern society. In 1985, Michio and Aveline opened a new campus of the Kushi Institute in the Berkshire Hills of western Massachusetts, and in 1990 educational activities were consolidated at a 600-acre estate in Becket. Thousands of people have attended programs at the institute over the years, and many of them have gone on to become teachers, chefs, counselors, and shiatsu practitioners. Today there are also Kushi Institutes in Europe (with headquarters in Amsterdam) and in Asia (with headquarters in Japan) and an estimated 500 to 1,000 macrobiotic centers around the world. Many of the holistic practices that the Kushis helped introduce, including shiatsu massage, acupuncture, palm healing, meditation, and visualization, are now widely offered at medical centers, hospitals, nursing homes, prisons, and other institutions. The Kushis went on to found the East West Foundation, the East West Journal, the Kushi Foundation, the One Peaceful World Society, and other organizations to spread macrobiotics worldwide. In the late 1980s, Kushi gave a pioneer seminar on a dietary approach to AIDS to hundreds of doctors in Gabon, West Africa, at a conference sponsored by the World Health Organization. In 1995, he received the Award for Excellence from the United Nations Society of Writers for “One Peaceful World” and other books. He was also nominated for the Nobel Peace Prize with recommendation from volunteers from the American Bar Association. In Washington, D.C., he made a presentation on macrobiotics to the White House Commission on Complementary and Alternative Medicine, and the U.S. House of Representatives unanimously passed a citation in his honor. He is president of the Green Cross Group of Japan. He was the father of five children, one of whom passed away, and many grandchildren. He lived in the Boston area with his wife.